purchase and discovering that it was currently going for a song on eBay. haggled the priest down to 50p. 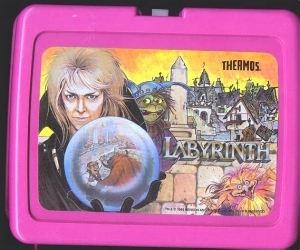 that the lunchbox she had googled was a rare factory defect showing Bowie with an extra testicle and that, in fact, her box was indeed worth a pound, but that it was also host to the spirit of glam rock. Ghosts from the 70s are amazing. G.lit(z)ch* proved keen to stay with Millicent although initially she wasn’t sure, what with him being a little creepy and also quite persistently keen to possess her and buy knock off Sweet compendiums. androgyny as they had been the first time around, and many a priest left unsuccessful. our rag tag bunch of misfits. G.lit(z)ch doesn’t speak per se but rather hums at low intensity the riff from Get it on by T.Rex, and when they stop you somehow know what they wanted. *We found this written in lipstick on the bathroom mirror one night.